I've recently reviewed the first novel in Elly Griffiths' Stephens and Mephisto series, The Zig-Zag Girl, so I won't go too much into the background of these books - essentially they are detective novels set in 1950s Brighton in which a police inspector, Edgar Stephens, teams up with stage magician Max Mephisto. This makes them sound very much like books that would fall into the 'cosy crime' genre, but while there are some small elements of that, the plot of Smoke and Mirrors is really rather dark. It opens with the disappearance of two children just before Christmas and has its fair share of tension and tragedy. Annie, who goes missing with her friend Mark, loves writing and performing plays - but they've recently taken a more sinister turn. Was she just a clever, creative girl with a gift for storytelling, or were her dramas a cry for help? 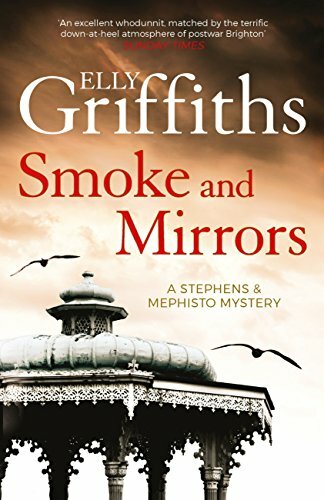 In all Elly Griffiths' books, the characters are as important as the mystery plots and Smoke and Mirrors is no exception. Edgar is fast falling in love with Ruby, Max's newly-discovered chorus girl daughter who has ambitions to follow Max into showbusiness. Max, now over 40 and pondering his future in variety, has struck up a relationship of sorts with his landlady. Moreover, Edgar's team at the police station, Emma and Bob, play a much bigger part in this novel and show signs of becoming part of the same sort of a solid ensemble cast that makes Griffiths' other crime novels, the Ruth Galloway series, such a success. Edgar, Max, Ruby, Emma and Bob all have convincing back stories, motivations and an intriguing set of insecurities: these are fully-realised characters who quickly start to feel like the readers' old friends. The period setting works well, although I do think Emma would perhaps encounter more sexism as a woman police officer in the early 50s than she does in this book, and while it's conceivable that Max's theatrical background would make him fairly enlightened about gay relationships, I'm not sure Edgar and his colleagues at the police station would be quite so enlightened - this book is set in the same year that Alan Turing was prosecuted simply for reporting that a robbery was committed by a friend of his male lover, after all. Overall, though, this is a pleasingly atmospheric read, particularly when Edgar's investigation strays into Max's world of stage magic, pantomime and drag acts. In short this is a great second installment in the Stephens and Mephisto series and while the mystery plot is of course neatly and satisfyingly resolved, plenty is left open character-wise for the next book in the series, which I'll certainly be reading soon.